Notwithstanding that the local watershed continues to be low and unreplenished due to lack of big storms, there is still some good fly fishing to be had towards the end of this summer in the high mountains. 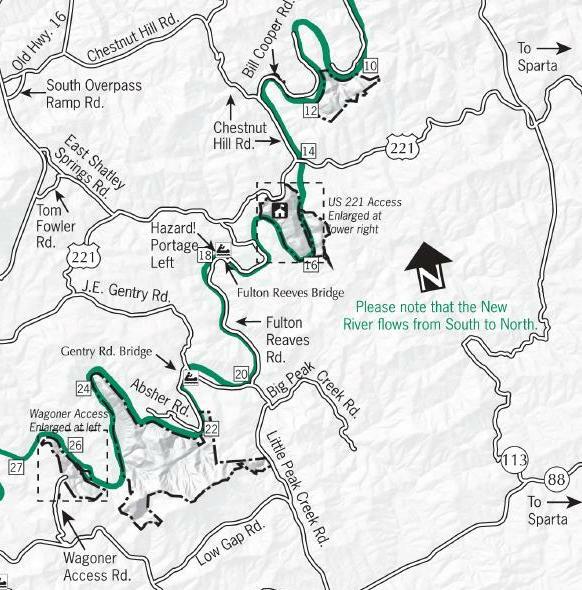 This August fellow Abingdonian, outdoorsman, and neighbor John Hortenstine, my son Karl, and I took a mid-week, evening fly fishing trip to one of our local trout streams in Southwest Virginia. 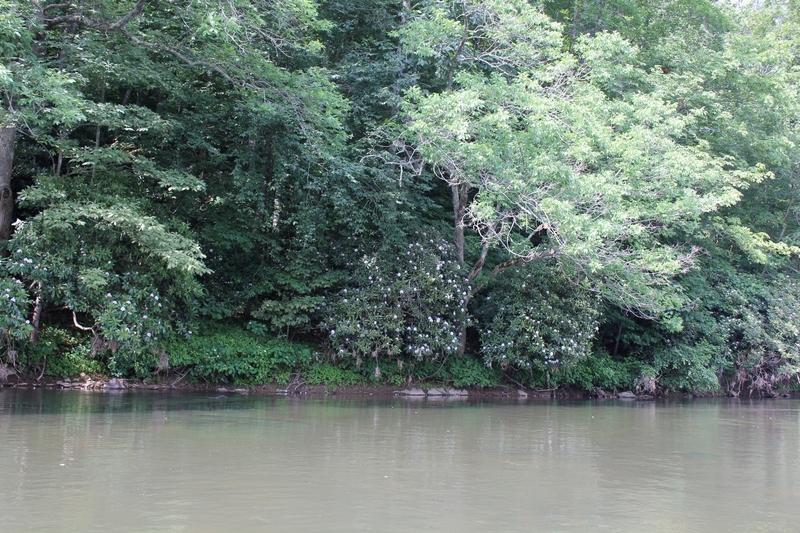 John took us out to one of those relatively unknown spots that anglers usually don’t reveal on websites. Blindfolded and sworn to secrecy before we were allowed to enter his car, John drove us to a secluded stretch of water where we were treated to some nice fishing. 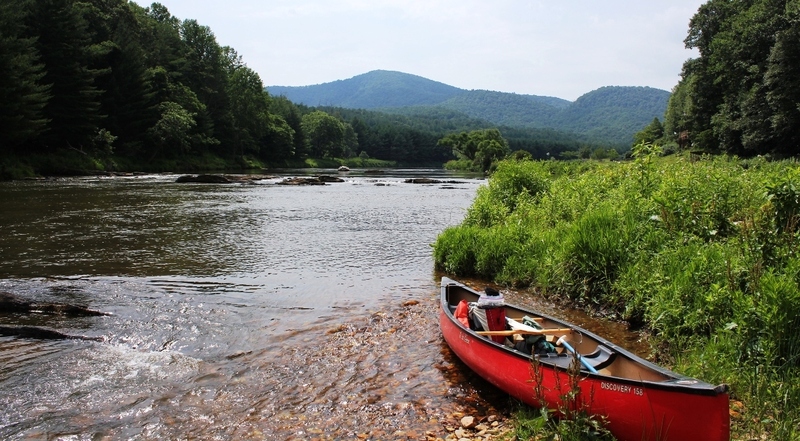 Once on the water, John and I took turns working the various pools as we worked our way upstream. Karl started several pools downstream and brought up the rear as a sweeper, fishing each of the downstream pools after they were rested for a while and documenting our trip with photography. Only John was getting all the action when we started out. While he might contend it was solely due to the skilfulness of the angler in question, at the time I suggested it was the fact that he was using a lighter tippet (the final part of the line that connects the leader to the fly), and that the fish were more interested in the particular pattern, or type, of fly he was using. John caught several nice fish right out of the gate, while my dry fly was just getting some rises and some looks, but the trout were ultimately not interested in the Parachute Adams I was offering. When the water is super low, your approach is a big part of the fishing. 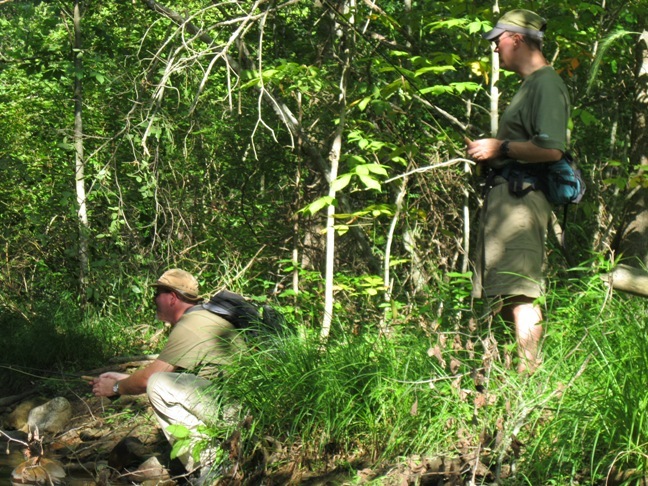 “Spooking” the fish by a clumsy approach will dampen, if not totally destroy, your chance of catching trout. 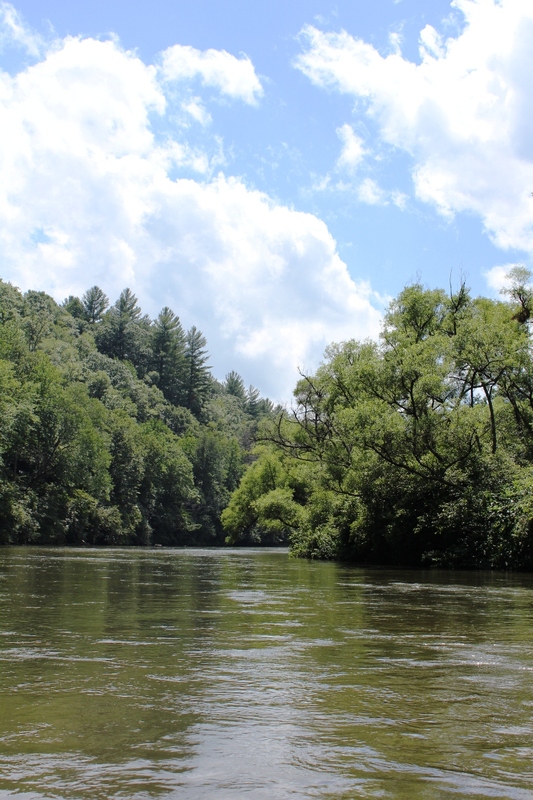 While the water is not always extremely clear in the Appalachians, when it’s low like it is right now in late summer, the fish will easily spook if you are not cautious. 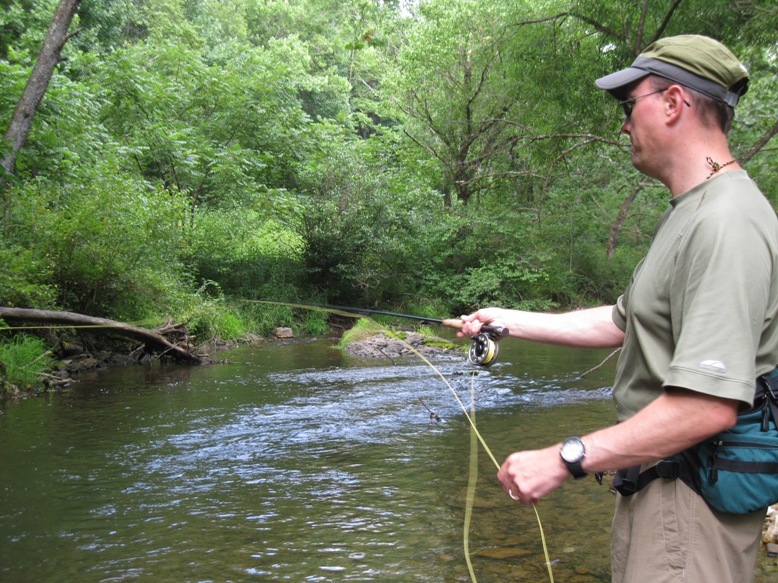 Even poor or unnecessary false casting of the fly line (where the line shoots out over the water before the actual cast of the fly out onto the water) will spook a rising trout in these little creeks. 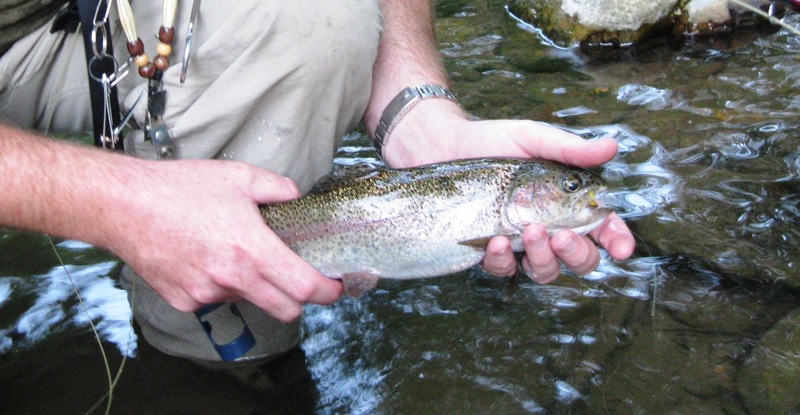 Of course, the flip side to the low water is that you have a better chance of actually seeing more of the trout in the pools and other places where the fish are more likely to be holding in the smaller water. 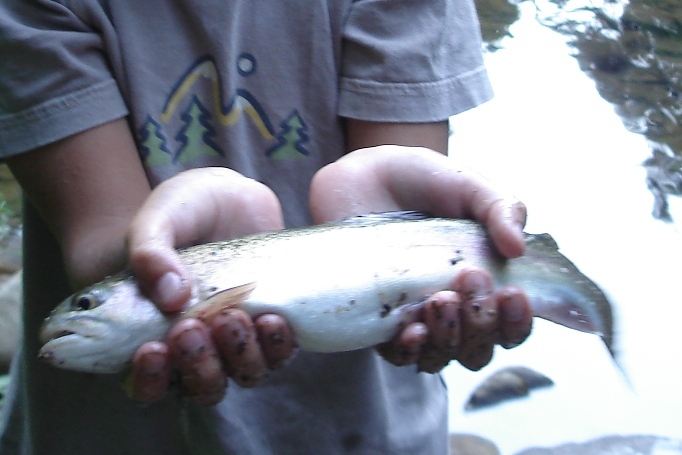 We saw several trout at a time in some of the pools, and a few were lunkers. 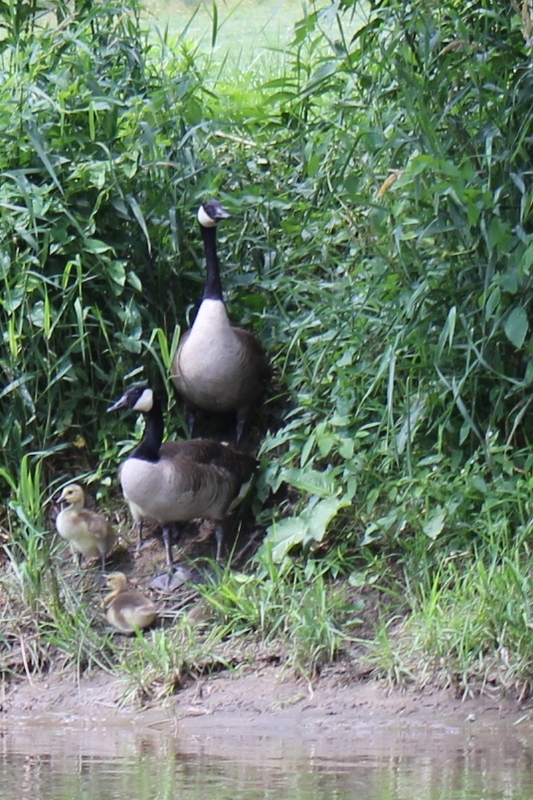 An additional benefit to being quiet on the water is that you may see additional wildlife. About halfway through our fishing, a small deer busted through the brush at the bank less than 100 feet from where we were fishing, and stopped right in the middle of the stream. It froze for a few seconds when it saw us. Then it crossed and was gone. 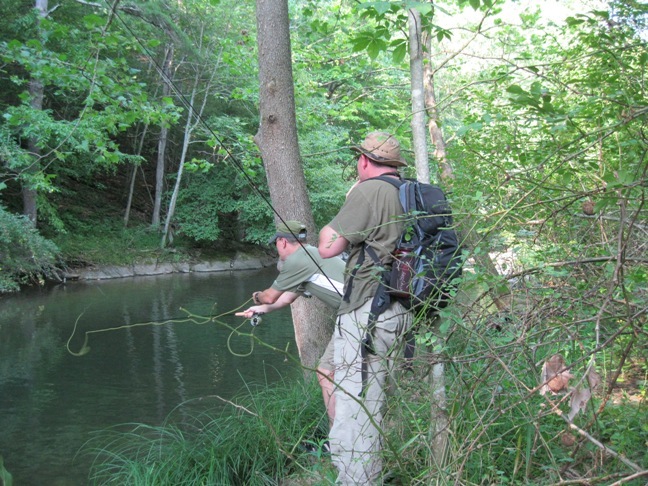 As we were fishing in this fashion, John had one rise—and a sip, or take—by a particularly large trout in a 2 foot slow-moving pool of clear water. The top part of the trout actually broke the surface of the quiet pool as it opened its jaws and slowly and deliberately sipped the fly. I immediately estimated this trout was 18-22 inches! 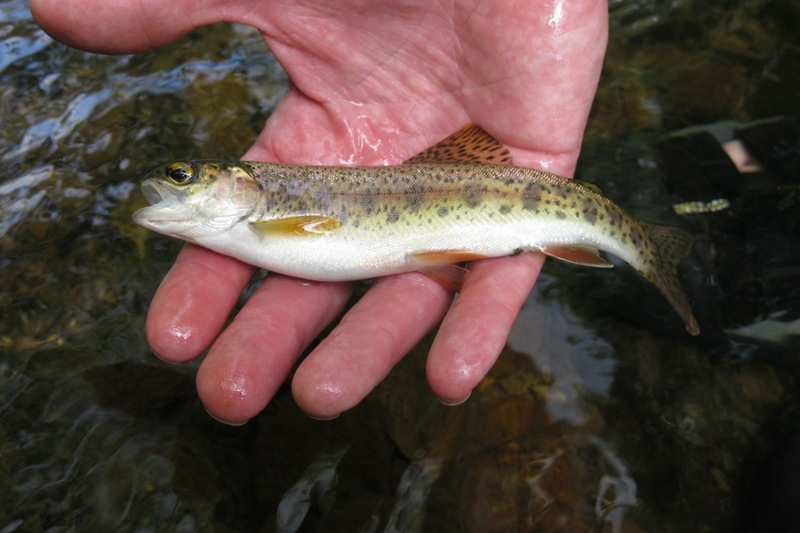 It was clearly visible in the water since the entire length of the trout was only an inch below the surface at the time it sipped the fly. We both watched mesmerized. Seeing a take like that is impressive on any level, but when it is your fly that is being taken it can send chills up your spine. 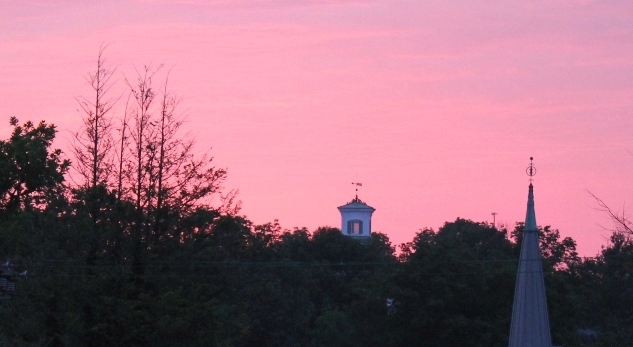 You draw in your breath with a silent gasp and your heart skips a beat. 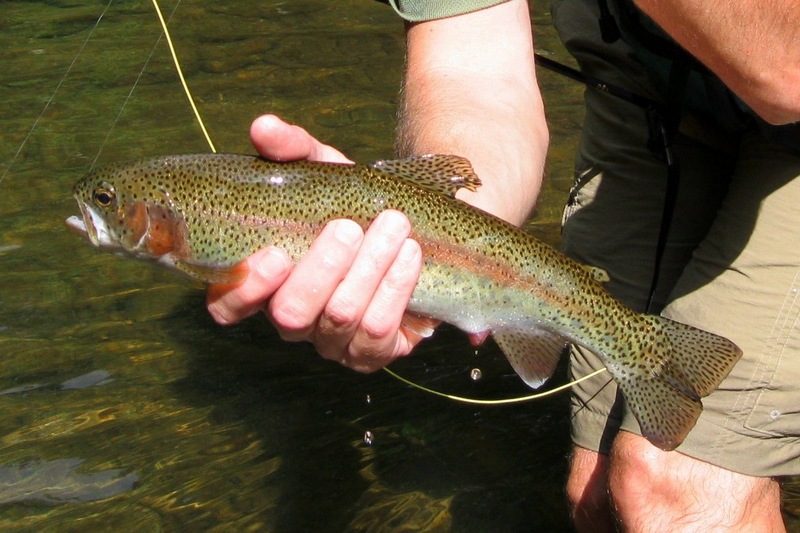 This is what a dry fly fisherman lives for. There was a momentary pause—we both knew this was a great fish. Then, timing it properly, John attempted to set the hook . . . but just at that moment the lunker ejected the fly as deliberately as he had taken it. The fish turned and returned to his lie at the bottom of the pool as the leader and tippet with the fly attached was withdrawn back towards us. The whole thing almost seemed to happen in slow motion. Watching it was agonizing, but awesome. 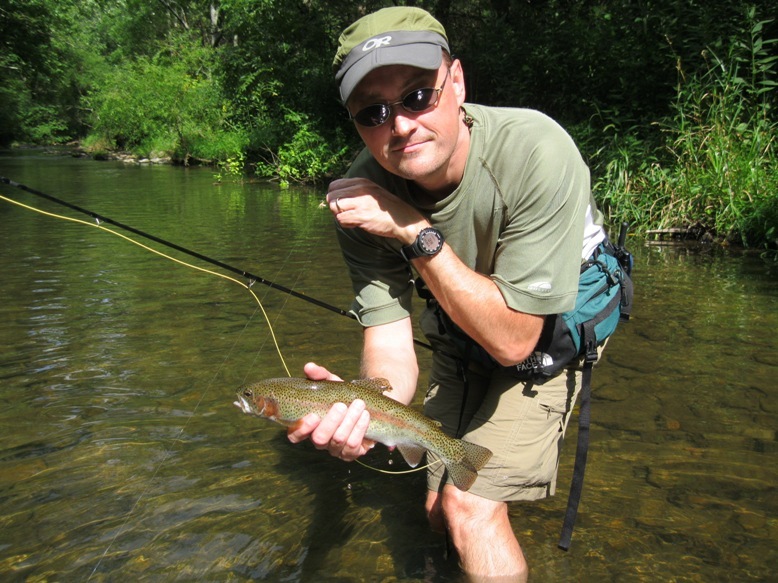 Setting the hook with a dry fly on a rising trout is much more difficult than on a nymph or streamer (let alone setting the hook using spinning tackle), because with the dry fly there is a longer period between the fish’s actual strike, or take, of the fly and the moment to set the hook. Getting the timing just right to set the hook while the fly has been taken, but before it is ejected, is challenging. 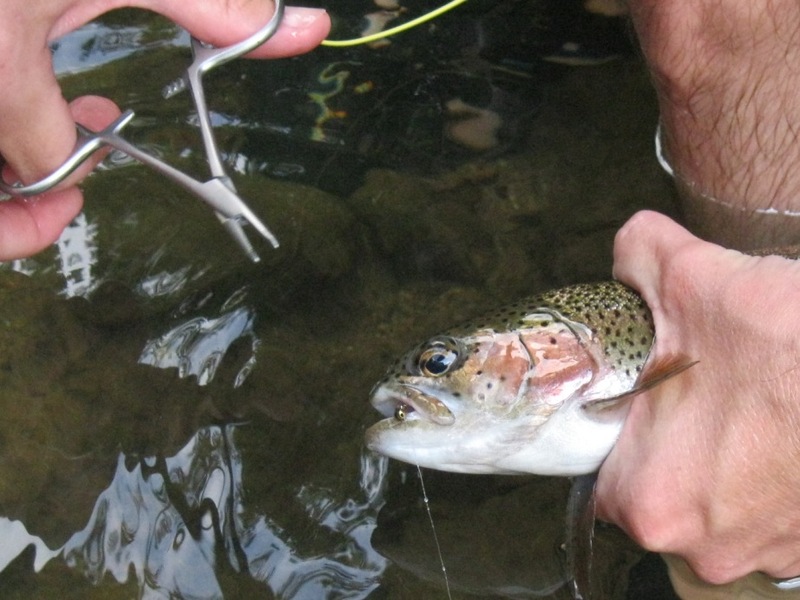 While there are sometimes violent strikes, if the trout are rising and merely gently sipping surface flies, the angler must concentrate, time the hook-set perfectly, and generally use more finesse to catch the fish. 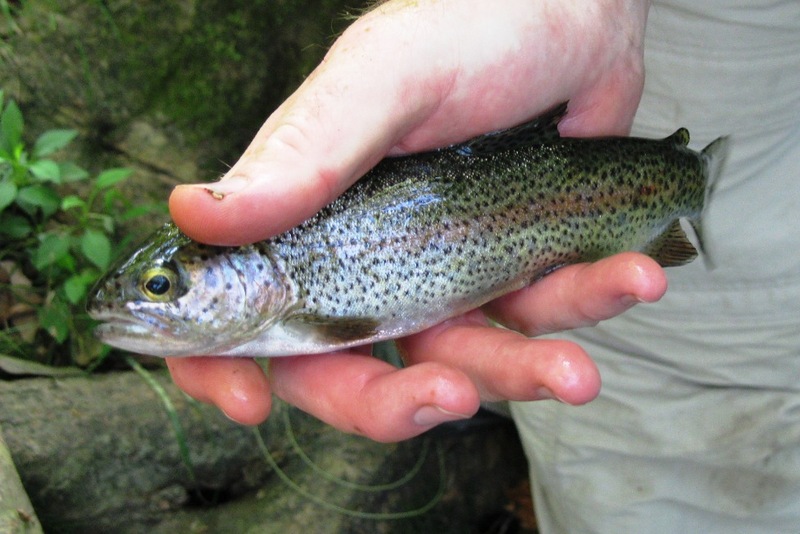 A large trout like the one we almost caught may be even more finicky, as it may have been caught before and is probably even more cautious than most fish. 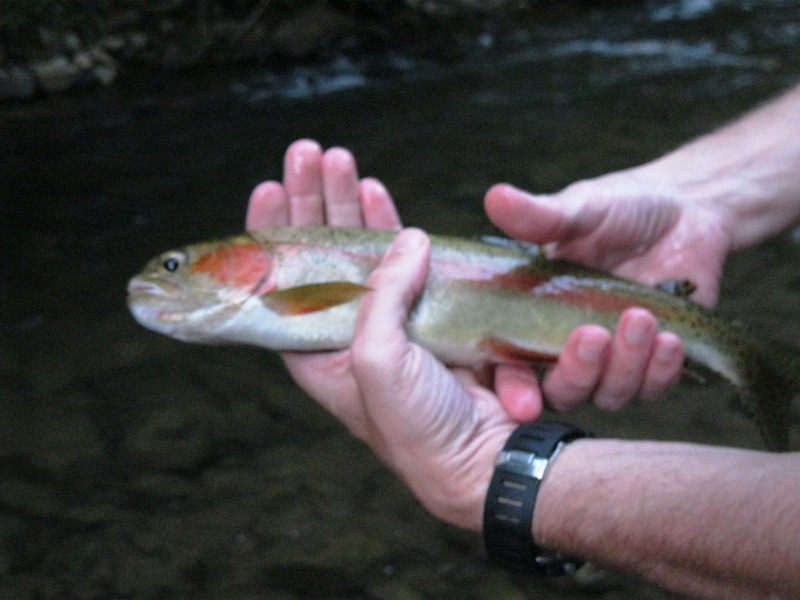 It takes a lot of skill, and also a little bit of luck, to catch a seasoned trout on a dry fly. In the end, there was plenty of wealth to spread around. 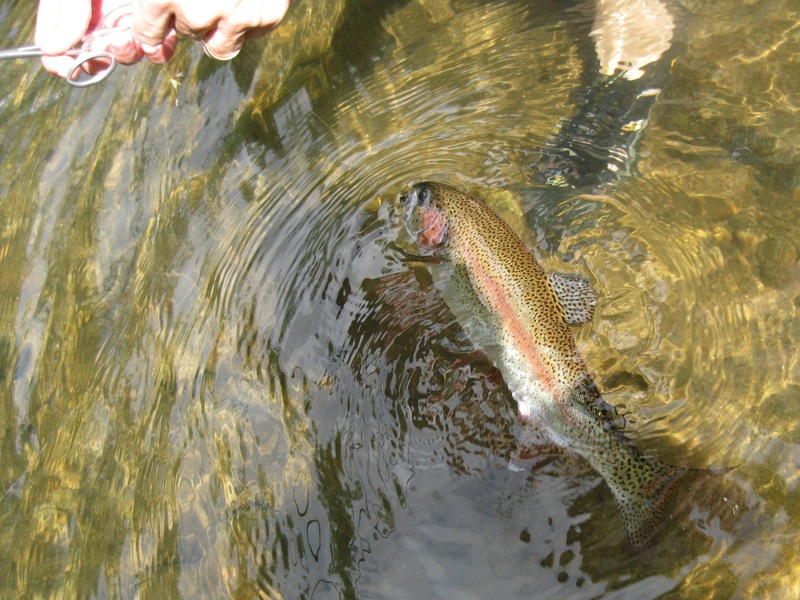 Last but not least, Karl got into the action with a nice, fat rainbow in one of the largest pools we fished. He now has the fly fishing “fever,” too: He is getting his own fly rod for the fall. This was a great little evening of fishing. 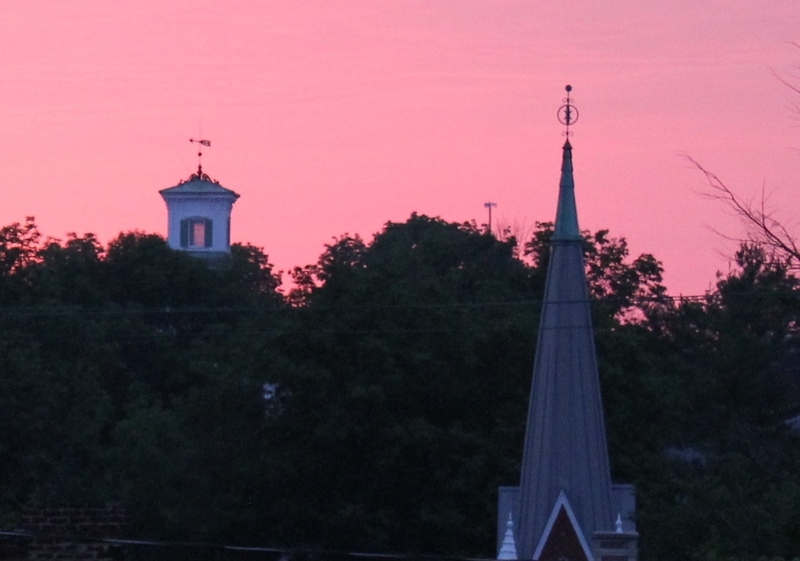 Willing trout, close to home, and a cool summer evening: It’s hard to beat that. P.S. — John did not really blindfold us; we were, however, truly sworn to secrecy! All photos in this article by Karl Thiessen.